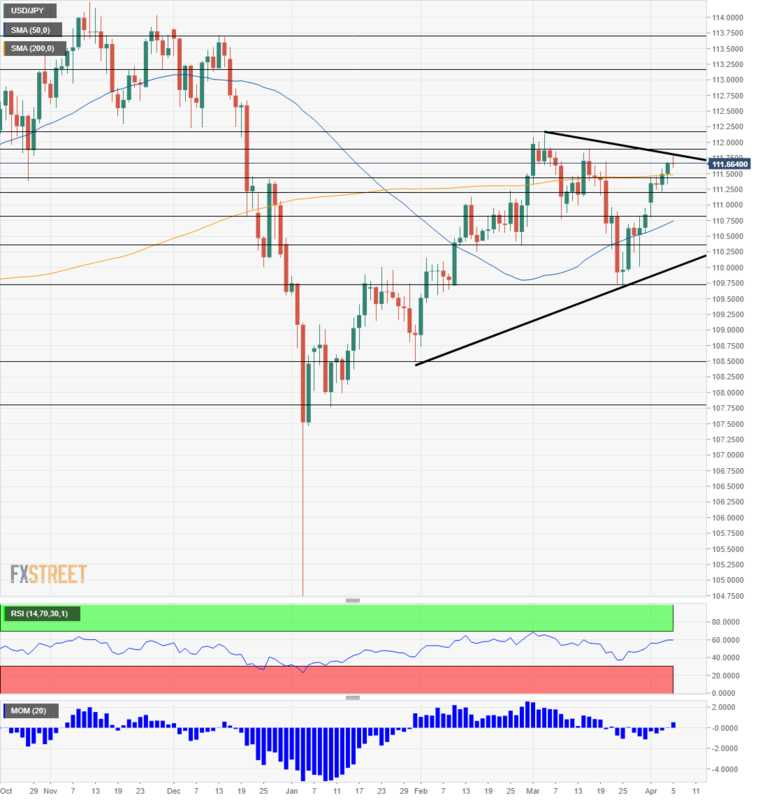 USD/JPY enjoyed a rally thanks to a calmer market mood. The FOMC minutes, inflation, and consumer sentiment stand out. The technical picture has become bullish for the pair but experts are bearish beyond the short term. It was a busy week of US data. Retail Sales kicked off the week with drops on all measures in February. However, January’s figures were revised to the upside. The ISM Manufacturing PMI was already clearly positive, printing 55.3 points, reflecting healthy growth. Durable Goods Orders also had a clear message, but a disappointing one, with the core of the core non-defense ex-air number dropping by 0.1% instead of rising. Weak data continued on Wednesday with a modest increase in private sector jobs: 129K and a substantial drop in the ISM Non-Manufacturing PMI: 56.1. Jobless claims dropped to 202K, the lowest since 1969 and served as a last hint towards the NFP. The US Non-Farm Payrolls came out at 196K, slightly above expectations, but wages rose by only 0.1% MoM and 3.2% YoY. The reaction was choppy and the US Dollar eventually came out as a winner. US President Donald Trump expressed optimism about clinching a trade deal with China, and so did his Chinese counterpart Xi Jinping, talking about “substantial progress.” The next improved the market mood and supported the pair. However, US Trade Representative Robert Lighthizer was already less optimistic, stressing the differences, mostly on implementation and enforcement. In Japan, all three quarterly Tankan figures fell short of expectations, echoing signs of a global slowdown seen in other places. Household Spending also fell short of expectations. The downbeat data gives the Bank of Japan no reason to consider changing its policy anytime soon. The Brexit saga continued gripping politics, but the movements in the pound were limited, thus remaining on the back burner for USD/JPY. The UK Parliament narrowly passed a law to prevent a hard Brexit. PM Theresa May reached out to the opposition to find a break to the logjam. Reports about North Korea working on new missiles also remained on the backburner but should be watched. After a hectic week, the upcoming on is undoubtedly lighter, but the US calendar still consists of three top-tier events. Factory Orders, due on Monday, serve as a warm-up. The data is for February, delayed due to the government shutdown. 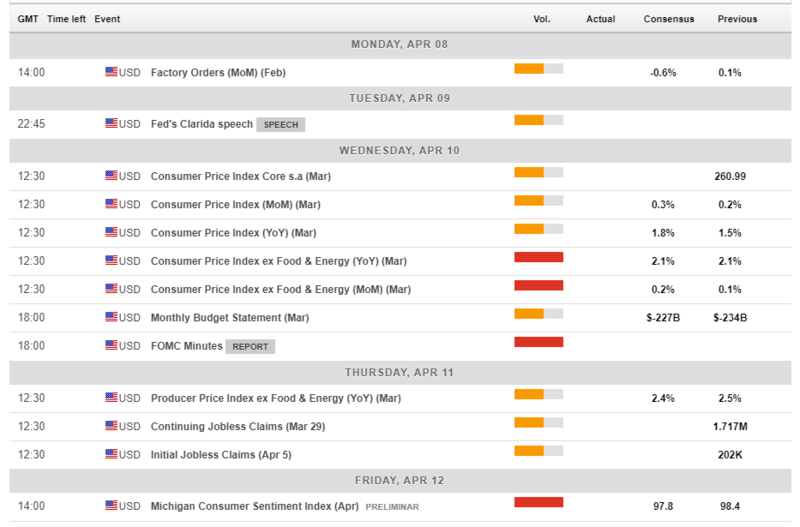 Wednesday is a busy day that kicks off the all-important Consumer Price Index for March. Back in February, Core CPI continued edging lower with a 2.1% YoY and a meager rise of 0.1% MoM. Headline inflation also dropped, down to 1.5%, due to energy prices. The comeback of oil prices could push headline inflation back up, but the focus remains on the core numbers, which are not expected to budge too much and will not impress the Fed. The FOMC Meeting Minutes is the second significant event of the day. The document details on the March meeting in which the Fed completed its dovish twist by removing rate hikes from the agenda for 2019. Also, Chair Jerome Powell and his colleagues announced a relatively quick end to the bond-buying program. The minutes will shed light on how officials are worried about the global economy, what they think of inflation, and perhaps if one or more are considering a rate cut, something markets are suggesting. Thursday’s Producer Price Index will provide some data on inflation in the pipeline, and jobless claims will be eyed after they hit the lowest levels since 1969. The last data point of the week is forward-looking: the University of Michigan’s preliminary Consumer Sentiment Index for April is forecast to edge lower but continue reflecting upbeat conditions. Trade talks have the most substantial impact on market sentiment, with upbeat news weighing on the safe-haven yen and reports of an impasse boosting it. The second sentiment mover is Brexit. The current exit date is Friday, April 12th. However, the UK Parliament passed a law forcing the government to ask for an extension and the EU Summit on Wednesday, April 10th, is projected to approve it. There are many twists and turns in the saga, but in general, the longer the extension, the better for the market mood. Also, any news on North Korea could have an impact. The rogue nation has not been a market-mover for many months, but things can change. The Japanese calendar is relatively light. Machinery Orders are of interest on Tuesday, but the main event is due early on Wednesday, with Bank of Japan Governor Haruhiko Kuroda. He is set to reiterate the BOJ’s ultra-loose monetary policy. Dollar/yen is trading below a moderate downtrend resistance line that has emerged recently. Momentum has turned positive, and the Relative Strength Index on the daily chart is rising but stays shy of the 70 level that reflects overbought conditions. The pair topped the 200 Simple Moving Average, a positive sign. All in all, the bias on USD/JPY is bullish. Above the downtrend resistance line, 111.90 was a peak in mid-March and served as resistance. The early February peak of 112.15 follows closely. The next lines are already from several months ago. 113.15 provided support in late November when the pair traded on higher ground. It is followed by 113.70 that held it down in mid-December. 114.00 is next. 111.45 was a peak in late December and remains relevant. The 200-day SMA is around that area too. 111.25 was a stepping stone on the way up in recent days and also capped USD/JPY in late February. 110.75 was a support line in March, and 110.35 provided support in February. Further down, the next support line is at 109.75 where the uptrend support meets the price. Lower, 108.50 was a swing low in late January, and it is where the uptrend resistance line begins. Dollar/yen looked technically bullish and rose as the atmosphere improved. However, dark clouds over the global economy loom. It could move up for another week, but its gains are limited. 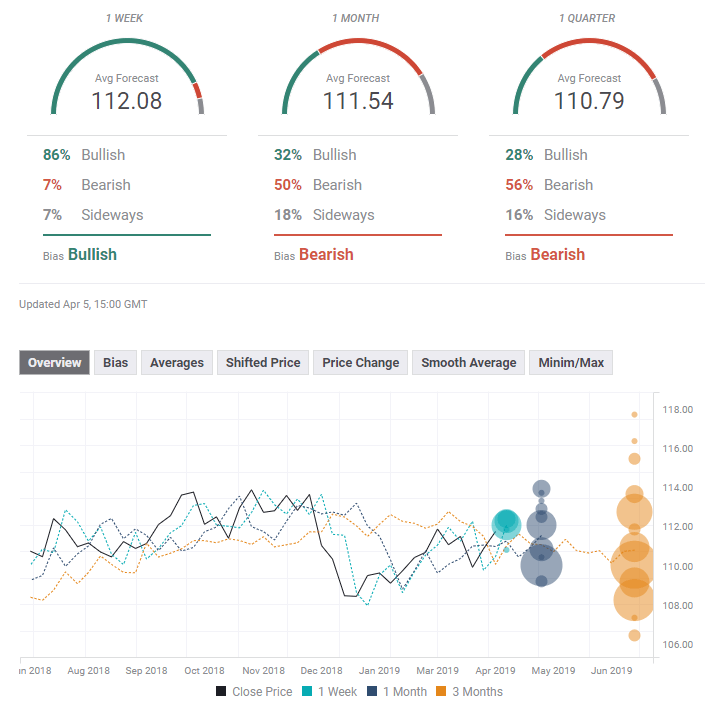 The FXStreet Poll shows that experts are bullish in the short term but bearish afterward. Targets are descending. The short-term average target price enjoyed an upgrade but the rest did not see any changes.